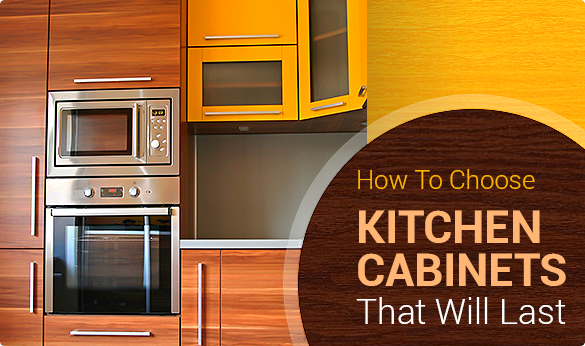 Kitchen cabinets offer more than just practical value: in fact, they are a major part of designing a new kitchen. A major consideration in choosing kitchen cabinets that will last is deciding on the materials that the countertops, doors, and hardware will be made from. If cost is not a large factor in your decision, it is always a good idea to purchase solid wood cabinetry rather than those made of particle board. While particle board is used by many manufacturers to cut costs, it won’t last nearly as long or look as good as solid wood. The most popular choice of wood for kitchen cabinets is oak. Available in a wide variety of stains from natural honey to a dark espresso, it is a strong and plentiful wood that will stand up to years of use and still look great. Maple and pine are also popular choices which are easy to work with and cost-effective. The exception to this is ponderosa pine which is more difficult to work with and commonly sold pre-stained. Another consideration you may wish to make when choosing your kitchen cabinets is whether or not you will want to change the style of your kitchen any time in the next several years. Lighter colored cabinets offer a higher level of versatility and flexibility in future renovations because they look good with any paint color, countertop, or backsplash and can be used to achieve any style from modern to traditional to country. Timeless and trend-proof, lighter cabinets evoke a clean and sanitary look often favored in kitchen spaces and will never go out of style. If you are considering selling your home soon or think that it is a possibility than you are probably better off going with light colored cabinets which will have a higher resale value. Dark kitchen cabinets can also be used to create charming and inviting kitchen spaces but they often require more design skill and forethought in order to make them work. Fashion is not as forgiving to dark cabinetry and it may limit future style options when renovating. Other the other hand, they add a formality, richness, and depth to a room that can be perfect for traditional spaces. If you love the look of dark cabinetry, pair it with lighter tones in order to create a nice contrast of light and dark elements. By combining dark cabinets with light paint, countertops, and backsplashes it is possible to create a cozy, inviting atmosphere without using only pale colors and tones.